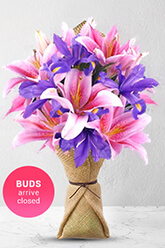 You just can't help smiling when you see this awe inspiring bouquet of pink Oriental lilies and purple Iris. Send this pink and purple sensation to someone and see the incredible change it can bring about.Lilies may be sent closed/partially closed in order to prevent damage and to last longer.Vase not included however if you would like to make your flower gift extra special, add a vase to your order. We have 3 vases to choose from; Standard, Premium, Superior. For Missy zFlowers.com recommends the Premium Vase. I'm glad to have found a trustworthy florist to send flowers from the US to Hong Kong. Very convenient and user friendly website. Delivery on time but the birthday girl didn't get the message we wrote online. She didn't know it was from us, very embarrassing.